Are you in the market for a unique seasonal job? 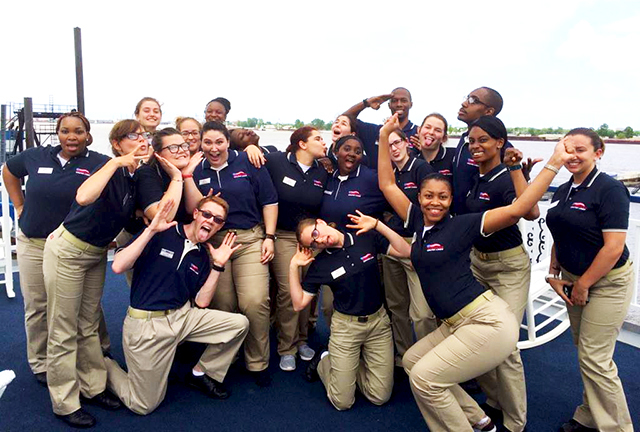 American Cruise Lines has several openings for onboard positions for the fall season. This is an ideal opportunity for recent grads or students taking a semester off. It could also be great for anyone who just wants a break and a fun, temporary job. You’ll live onboard a cruise ship for 16 weeks, with the opportunity to visit some of the 28 states ACL ships visit throughout the year. As is typical of this kind of work, you’ll face long work days, up to 12 hours a day seven days a week for your stay. You also risk a bout of homesickness, but you’ll get unique work experience in a lucrative industry, see some awesome sights and bank a lot of money in just a few months. Plus, you’re sequestered on a cruise ship with room, board and meals provided, so you won’t face temptations to blow your paycheck. You’ll arrive home four months later with a serious nest egg. These positions pay between $600-$950 per week. That’s between $9,600 to $15,200 in income in four months! Deckhands help with an array of tasks, from customer service to “participating in steering the ship,” as well as standard maintenance and cleaning. “Galley steward” is ship-speak for “dishwasher,” and, frankly, it has a nice ring to it, doesn’t it? You’ll work alongside the chefs in the kitchen to wash dishes and silverware and keep the galley — kitchen — clean. You may also help with waiting tables and guest service as necessary. This position is described as a great start to a career in hospitality, with potential for upward mobility if you want to continue with the company beyond the seasonal position. The hotel manager oversees a team of 10 to 20 stewards in housekeeping tasks, such as servicing guest rooms. You’ll also help train stewards. This position requires a bachelor’s degree in hospitality or business management and previous hotel housekeeping experience. It’s an opportunity to break into the industry with a position that lets you travel. You don’t need previous experience for most of these positions, so this is an opportunity to break in if you also want to pick up future cruise ship jobs. You must be at least 18 years old, have a high school diploma, pass a pre-employment drug test, have no “major arm or neck tattoos,” and have the stamina for long hours and, in some cases, heavy lifting. This is U.S.-based employment — the cruise line is based in Jacksonville, Florida — so you must be authorized to work in the U.S.
Are you ready to get in shape and get a tan while friends on the mainland settle in for winter? You can learn more about these positions here. Your Turn: Have you worked a unique seasonal job?